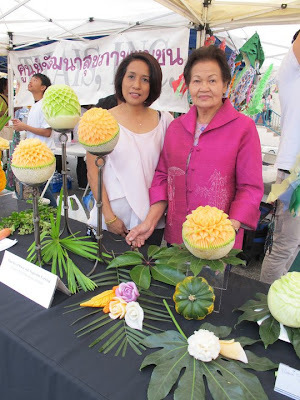 Continuing on my commitment to portray the work of fantastic Fruit and Vegetable Carvings artists on my Blog, today I will be presenting to you the work and more information about my Friend and wonderful Fruit and Vegetable Carving Artist Boonmee Nishimoto. Here she is seen with her Teacher Saowapa Albright (Sophie). I take this opportunity to express my deepest regards and respect to her teacher Saowapa Albright (Sophie). 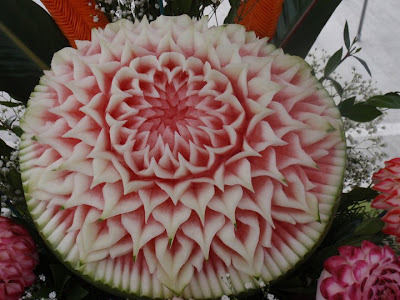 who has been a teacher to so many wonderful Fruit and Vegetable Carving artists. You may be seeing her on so many of my Blog Posts of the wonderful artists that I am writing about on my Blog. Boonmee Nishimoto is a native of Thailand. 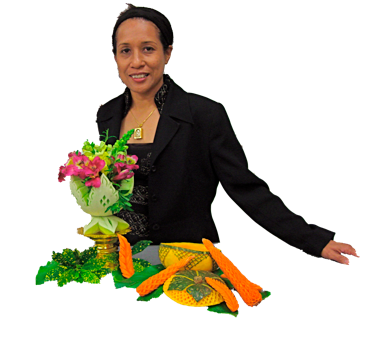 She is both an instructor and a designer of Thai fruit and vegetable carvings. Boonmee has been teaching beginning and intermediate classes at the Adult Extension Program at Los Angeles Harbor College in Southern California. She is also available for a one-on-one course, where you will have her undivided attention. 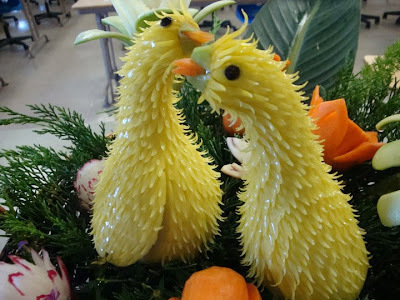 The difference between the group course offered at the adult extension program and the one-on-one course is that you will learn to carve a project of your choice and you will not leave (unless you choose to do so), without completing your edible art. 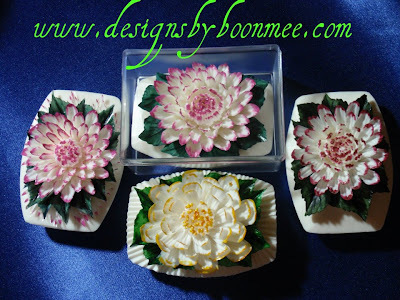 Boonmee has been practicing the ancient art of Thai fruit and vegetable carvings for many years. Just like a music virtuoso, Boonmee maintains her high level of craftsmanship by continuing to take classes and seek council from her mentor of many years.Besides teaching, Boonmee offers a unique “catering” service. 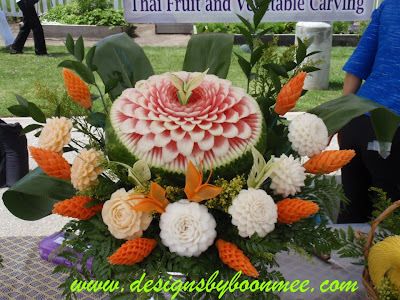 With your needs in mind, Boonmee will design and carve fruits and vegetables Thai style for your event(s). Think of highlighting your table with ornately carved edible fruits and vegetables. They can be eaten during the meal event or they can be offered as parting gifts. 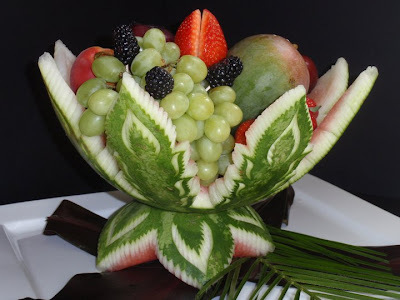 What a unique treat to give to yourself and to your guests. 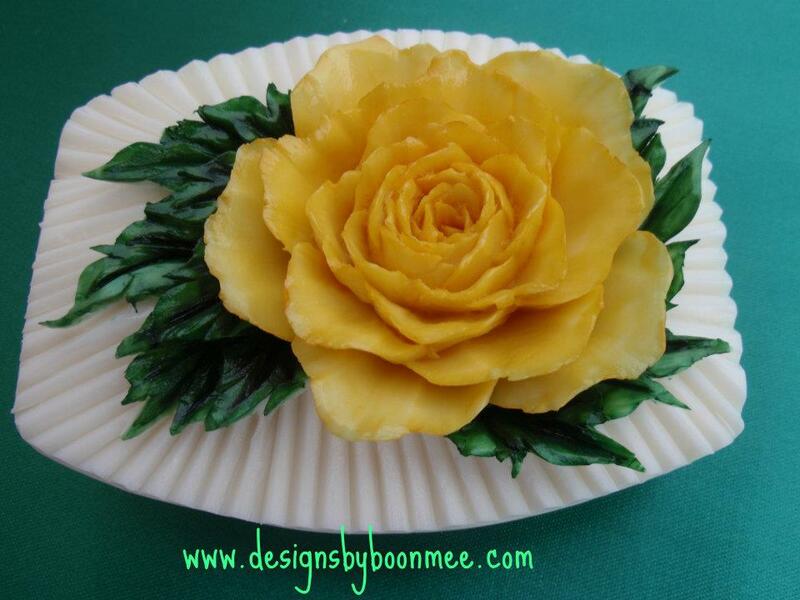 She also conducts amazing classes for which you may contact her. 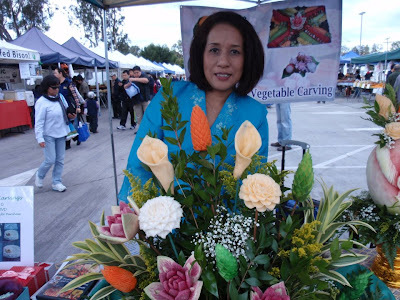 As a distinguished carving artist Boonmee Nishimoto has a wide range of carvings to display. I have displayed only some of them here and if you want to see more of her work you just have to access her work both at her facebook Profile at - Boonmee Nishimoto and also at her site at Designs By Boonmee and it will take you to her Album/Gallery. 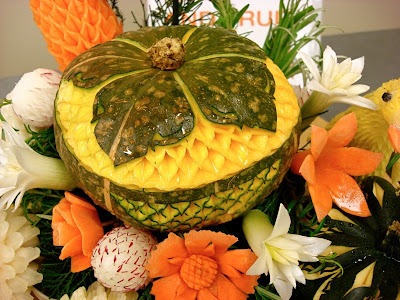 This carving above is a Crok Neck Yellow Squash Carving. 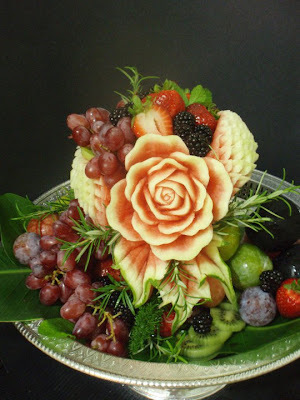 Another one of her wonderful Fruit and Vegetable Carving Displays. 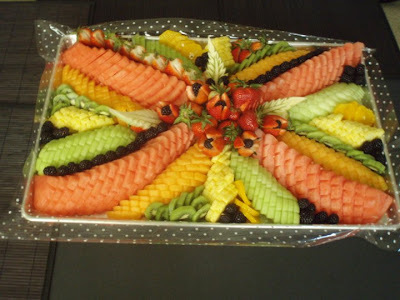 Here are two great Photographs of Fruit Platters created by Boonmee. For an Artist as distinguished as her it is obvious that you are in for some more great surprises. 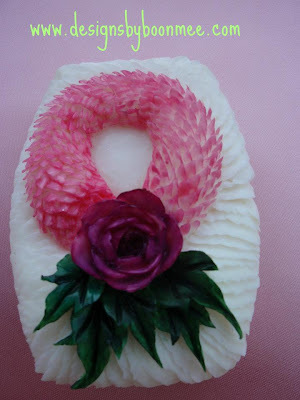 Yes none other than some of her fantastic Soap Carvings which are so delicate and exquisite that you would even think twice before handling them. 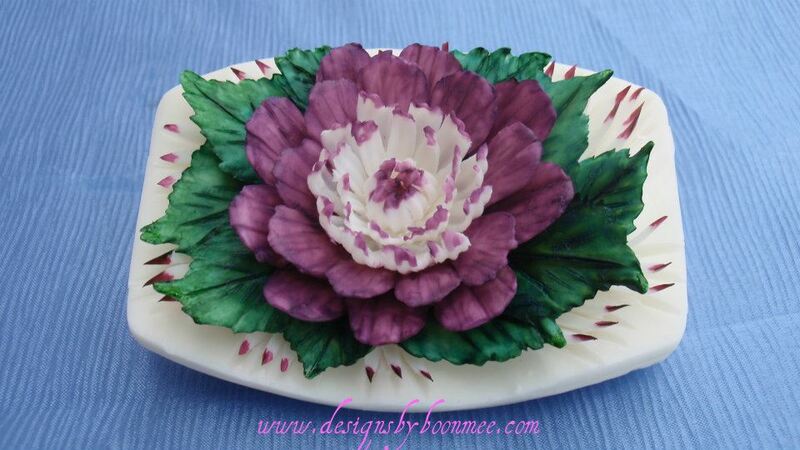 Now if you still want to see more of her fantastic work and Carvings you may click on this image and go to her site where you can watch a wonderful Slidehshow of some of her best carvings!